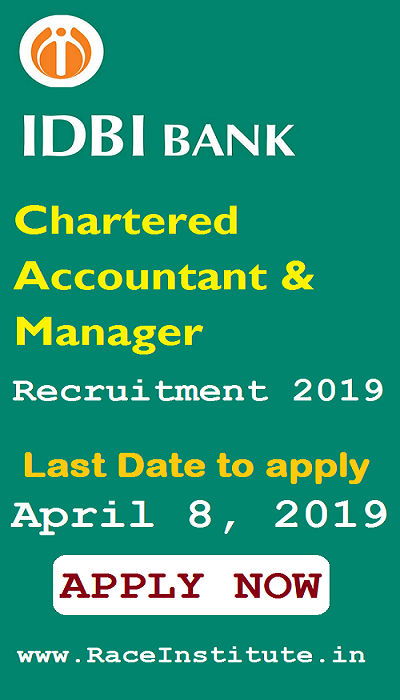 Industrial Development Bank of India (IDBI) released a Recruitment Notification for the Post of Chartered Accountant and Manager Vacancies. A total of 40 vacancies will be filled under the recruitment process. Interested and eligible candidates are advised to apply from March 26, 2019 to April 08, 2019. Candidates age should be between 35 to 45 years for DGM Posts, 28 to 36 years for AGM, 25 to 35 years for Manager Posts as on 01.03.2019. Age relaxation applicable as per Govt Rules and Regulations. Preliminary Screening of Eligible Criteria / Experience, Group Discussion / Personal Interview if applicable.